Bone tissue has an exceptional quality to regenerate to native tissue in response to injury. However, the fracture repair process requires mechanical stability or a viable biological microenvironment or both to ensure successful healing to native tissue. An improved understanding of the molecular and cellular events that occur during bone repair and remodeling has led to the development of biologic agents that can augment the biological microenvironment and enhance bone repair. Orthobiologics, including stem cells, osteoinductive growth factors, osteoconductive matrices, and anabolic agents, are available clinically for accelerating fracture repair and treatment of compromised bone repair situations like delayed unions and nonunions. Preclinical and clinical studies using biologic agents like recombinant bone morphogenetic proteins have demonstrated an efficacy similar or better than that of autologous bone graft in acute fracture healing. A lack of standardized outcome measures for comparison of biologic agents in clinical fracture repair trials, frequent off-label use, and a limited understanding of the biological activity of these agents at the bone repair site have limited their efficacy in clinical applications. Fracture healing involves a well-orchestrated cascade of molecular and cellular events that recapitulate the process of embryonic endochondral bone formation and results in formation of new bone across the fracture site. The majority of fractures heal uneventfully, but it has been reported that 5% to 10% of all fractures either fail to unite or demonstrate a delay in healing . Nonunions often require multiple surgical procedures to heal, leading to considerable morbidity, lost work days, and increased health-care costs . Hence, there is a need to develop therapeutic strategies that accelerate bone repair and that would either prevent or treat slow-healing fractures and nonunions. Successful regeneration of bone involves the interplay of four critical elements: osteoinductive growth factors (induce differentiation of stem cells to osteoblasts), stem cells that respond to osteoinductive signals (osteogenic), an intact vascular supply, and, lastly, a scaffold that supports cellular attachment, proliferation, and ingrowth (osteoconductive matrix) [3, 4]. An improved understanding of the molecular and cellular events that occur during bone repair and remodeling has led to the development of biologic therapies that enhance bone repair in fractures and nonunions. The US Food and Drug Administration (FDA) definition of biologics includes a wide range of products such as blood and blood components, somatic cells, gene therapy, tissues, and recombinant therapeutic proteins. The purpose of this article is to provide a comprehensive review of the biologic agents that can enhance bone repair and either are clinically available or are being assessed in clinical trials. Cell-based therapies, growth factors, osteoconductive matrices, and anabolic agents are available clinically to enhance bone repair. Osteoconductive matrices, including demineralized bone matrix and platelet-rich plasma, are not discussed in this review. Cellular therapies aim to replenish or augment (or both) the reparative cellular pool at the site of bone repair. Cell-based therapies involve transplantation of stem cells or progenitors (or both), which can be in the form of the processed native tissue, purified stem cells, culture-expanded stems cells, or genetically modified stem cells . Cell-based therapies are an attractive option for the treatment of compromised bone healing because they are usually autologous and therefore do not carry the risk of rejection. Adult stem cells are pluripotent and are characterized by their distinct ability to self-renew . They are present in all tissues, albeit in small numbers, and participate in physiologic remodeling/turnover of normal tissues and repair of the injured tissue. Adult stem cells are capable of differentiating into multiple types of progenitors, which are committed to become a particular phenotype (osteoblast, chondrocyte, fibroblast, adipocyte, tenocyte, and myoblast) in the presence of an appropriate biologic stimulus  (Figure 1). Differentiation pathways for mesenchymal stem cells. Bone marrow is the most well-studied source of stem cells for bone repair. However, stem cells have been harvested from other tissues, including muscle, periosteum, adipose tissue, vascular pericytes, dermis, and peripheral blood . Friedenstein and colleagues  were the first to demonstrate the presence, in the bone marrow, of fibroblast-like stem cells that were plastic adherent and capable of differentiating into multiple phenotypes. The fibroblast-like cells were later termed mesenchymal stem cells (MSCs) or bone marrow stromal cells. Clinical studies have demonstrated the safety and efficacy of culture-expanded MSCs to enhance bone repair [8, 10–13]. In a pilot clinical study, Marcacci and colleagues  used autologous bone marrow-derived culture-expanded osteoprogenitor cells seeded on a ceramic scaffold to treat four patients with diaphyseal bone defects (humerus, ulna, and tibia) that were stabilized with external fixators. All of the bone defects demonstrated complete healing at an average time of 6 months. There were no complications or adverse effects with this therapy during the follow-up period of 6 or 7 years. Quarto and colleagues  demonstrated successful healing of large bone defects (average of 5 cm) in three patients (tibia, ulna, and humerus) with autologous bone marrow-derived MSCs. The culture-expanded MSCs were loaded on a ceramic scaffold and delivered at the time of surgery. In all three patients, radiographs and computed tomography scans demonstrated abundant callus formation and good integration at the interface with the host bone by the second month after surgery. MSCs can also be differentiated in vitro to osteoblast precursors by growing them in an osteogenic differentiation media prior to transplantation in the host. In an open multicenter clinical trial, 64 patients with delayed healing of long bone fractures (femur, tibia, radius, ulna, and humerus) were randomly assigned to receive percutaneous injection of autologous cultured osteoblasts (Ossron; Sewon Cellontech, Seoul, Korea, n = 31) or no treatment (controls; n = 33) . There was a significant increase in the radiographic callus formation score at 2 months in the cultured osteoblast treatment group compared with the controls. Although the percutaneous injections of culture-expanded osteoblasts led to increased bone formation in this study, no data regarding the final healing rates and the number of secondary interventions in the study groups were available. Some proponents of this strategy believe that the MSCs participate in bone repair as a cellular source of growth factors and cytokines, which recruit osteoprogenitor cells from local and systemic sources via paracrine mechanisms. Whether the transplanted MSCs actually get incorporated in the regenerated bone is still a matter of debate [5, 6, 14]. Culture expansion of the stem cells has an advantage of increasing the number of cells that can be transplanted. However, it is associated with a theoretical risk of infection and can induce senescence and lead to loss of the multipotent potential of stem cells. Moreover, the culture expansion step may not be cost-effective. Identifying anatomic sources with the highest concentration of adult stem cells and refinement of available techniques to purify and concentrate stem cells from the bone marrow would be a more cost-effective way of using this cell-based therapy. Bone marrow aspirate (BMA) contains stem cells that have the potential to transform into osteoblasts in response to osteoinductive signals. Bone marrow contains a heterogeneous population of cells, including stem cells, progenitor cells, and hematopoietic elements . Traditionally, bone marrow aspiration has been performed from the iliac crest, but alternative sites, including the vertebral body, proximal humerus, proximal tibia, distal tibia, calcaneus, and fibula, have also been described. Bone marrow aspiration and percutaneous bone marrow grafting have been used to treat both delayed unions and nonunions [15–23] (Table 1). Twenty-eight patients were treated after an average of 25 weeks after initial fracture (femur, ulna, tibia) with percutaneous BM injection that was performed in the office under radiographic control. Five out of 28 patients required two BM injections. Twenty consecutive patients with established tibial nonunion (>24 weeks after initial injury) were treated with casting and BM injection under local anesthesia. A maximum of 15 mL of marrow was injected in one sitting. Sixty patients with tibial nonunions were treated with autologous BM injections, which were performed under general anesthesia and radiographic guidance. All the nonunions that did not heal with BM injection had received fewer than 30,000 progenitors. Prospectively followed cohort of 69 long bone nonunions (>6 months after initial injury) were treated with BM injection, which was performed under regional or general anesthesia and radiographic guidance. Eight nonunions required two injections. Demineralized bone matrix was used as a carrier. Twenty consecutive patients with established long bone nonunion were treated with casting and BM injection. BM (15 to 20 mL) was injected twice with an interval of 3 weeks. Eleven long bone nonunions were treated with autologous BM injection, which was performed under regional or general anesthesia under fluoroscopic guidance. Twenty tibial nonunions were treated with autologous BM injection, which was performed under general anesthesia and radiographic guidance. Casting (n = 10) or intramedullary nail (n = 10) was used for immobilization. Two out of 20 patients required two injections. Osteogenic properties of BMAs have been demonstrated in preclinical studies in small and large animal models of bone healing (fracture and critical-sized bone defect) and in clinical studies. Connolly and colleagues  were among the first to demonstrate the efficacy of percutaneous bone marrow injection for the treatment of tibia nonunions. In a cohort of 20 tibial nonunions, bone marrow was aspirated (average volume range of 100 to 150 mL) from the posterior iliac crest under general anesthesia and delivered to the fracture site either via a percutaneous injection under radiographic guidance or as a paste mixed with demineralized bone matrix during an open procedure. Eighteen of the 20 tibia nonunions (90% success rate) healed at a median time of 6 months after the bone marrow injection. Transient discomfort at the donor site was the most common complication with bone marrow aspiration. Subsequently, in a larger study (n = 100), Connolly  reported a success rate of approximately 80% with this therapy. Khanal and colleagues , in a prospective randomized clinical trial, evaluated the role of percutaneous bone marrow grafting in acute tibia fractures. Forty patients with acute (<7 days), closed tibia fractures were randomly assigned to receive either two injections of autologous BMAs and cast treatment (n = 20) or cast treatment alone (n = 20). All bone marrow injections were administered percutaneously by using the palpation technique. There was a significant reduction in the time to osseous union in the percutaneous bone marrow grafting group (mean of 3.65 months; P <0.0004) compared with the controls (mean of 4.3 months). However, there was no significant difference (P >0.05) between the two groups with respect to the final healing rates. The optimum concentration and number of stem cells required to induce successful healing are not known. In a retrospective study involving 60 atrophic tibia nonunions (age range of 18 to 78 years), Hernigou and colleagues  demonstrated complete healing in 53 of 60 nonunions that were treated with a single injection of BMA. Bone marrow analysis of the aspirated specimens by using fibroblast colony-forming units (CFU-F) as a surrogate marker for osteogenic cells demonstrated that the tibial nonunions that failed to respond to the bone marrow injection (n = 7) received fewer than 30,000 progenitors but that the patients who achieved union received more than 30,000 progenitors . The concentration of stem cells in the bone marrow is known to vary widely among the healthy adult population, and age, gender, site of aspiration, and volume of aspiration have been shown to affect the number of stem cells in the bone marrow [26–28]. Therefore, it is very difficult to predict the number of stem cells in the BMA on the basis of the volume of bone marrow concentrate alone. Moreover, with the currently available methods (CFU-F estimation in tissue culture), it is not possible to accurately determine the number of stem cells that are present in a given volume of BMA prior to percutaneous injection . Because the biology of the fracture/nonunion and the healing response that occurs varies depending on the patient characteristics (smoking and diabetes), the personality of the fracture, and the microenvironment (previous radiation, fibrosis, infection), it may not be feasible to calculate a single absolute progenitor cell number that will induce successful healing in all types of nonunions in the entire skeleton. In fact, this therapy will have to be individualized for optimal efficacy. Concentration of the BMA via centrifugation is one of the means of increasing the osteogenic efficacy of BMA [19, 25, 26]. In a preclinical study in our laboratory, we found that the stem cell concentration in healthy bone marrow donors (mean age of 25 years) ranged between 64 and 2,993 CFU-F/mL and that an average seven-fold increase in the CFU/mL can be obtained following concentration of bone marrow by using a commercial centrifuge . In clinical studies, an average four- to seven-fold increase in concentration of CFU/mL has been reported with centrifugation [16, 25, 30]. Percutaneous autologous bone marrow grafting is a safe and minimally invasive treatment that can be performed in an outpatient setting under local anesthesia. It avoids the complications associated with the open bone graft harvesting procedure. However, this technique, if used alone, may not be sufficient to induce healing of complex fractures with large bone gaps and a compromised biological environment at the fracture site. Furthermore, percutaneous injection of the bone marrow may not be feasible in nonunions with pre-existing angular deformities, as this would require an open procedure to access the deformity and nonunion [16, 19]. Bone morphogenetic proteins (BMPs) belong to the transforming growth factor-beta super family and are potent osteoinductive agents [31, 32]. BMPs were discovered following a landmark experiment by Marshall Urist, who observed that demineralized, lyophilized segments of allogenic bone matrix implanted into the intramuscular pouches in rabbits led to reproducible induction of new bone . Twenty members of the BMP family have been identified to date and are further subgrouped on the basis of their physiologic function and their gene sequences. BMPs are synthesized as large precursor molecules and are secreted as extracellular active dimeric forms. BMPs bind to the extracellular domain of the BMP receptors (serine/threonine kinase receptors; types I and II) and this in turn activates the smad-dependent and smad-independent signaling pathways that are responsible for modulating gene transcription [34, 35]. BMPs play a pivotal role in the growth and differentiation of various tissues and organs during embryonic development . BMPs are involved in early limb development and embryonic patterning of limbs and induce differentiation of stem cells into cells of osteochondroblastic lineage. BMPs also enhance maturation and function of differentiated cells (osteoblast and chondrocyte) [31, 32, 35]. BMP-2 and BMP-7 (osteogenic protein-1) are the most well- studied BMPs and have been cloned and reproduced with recombinant technology. Multiple randomized clinical trials and small case series have evaluated the role of recombinant BMPs in the treatment of nonunions and acute fractures (Tables 2 and 3). The BESTT (BMP-2 Evaluation in Surgery for Tibial Trauma) trial was the first randomized controlled trial that evaluated the safety and efficacy of human recombinant BMP-2 (rhBMP-2) for treatment of open tibial fractures . Acute open tibia fractures were randomly assigned to receive either standard of care (intramedullary nail fixation and routine soft tissue management; n = 150) or standard of care and rhBMP-2/absorbable collagen sponge (rhBMP-2/ACS) (0.75 mg/mL, n = 151 or 1.5 mg/mL, n = 149). The rhBMP-2 group (1.5 mg/mL) had significantly faster fracture healing, lower infection rates (Gustilo-Anderson type IIIA and IIIB fractures), and significant reduction in the frequency of secondary interventions as well as invasive interventions compared with the control group. There were no significant differences in the adverse events between the control and rhBMP-2 groups. Two hundred seventy-seven patients with open tibia fractures were randomly assigned to receive standard of care (SOC) (intramedullary nail and soft tissue management; n = 138) or SOC + rhBMP-2(1.5 mg/mL; n = 139). rhBMP-2 did not significantly accelerate fracture healing in open tibia fractures compared with the controls. The study was halted prior to completion because of a trend toward increasing infection in the rhBMP-2 group. Thirty diaphyseal tibia fractures with cortical defects were randomly assigned to two treatment groups: rhBMP-2 + allograft (n = 15) or autogenous ICBG (n = 15). Open tibia fractures were randomly assigned to receive intramedullary nail and routine soft tissue management alone (n = 169) or in combination with rhBMP-2 (n = 169). rhBMP-2 decreased the frequency and invasiveness of secondary interventions and reduced the infection rates in grade III open tibia fractures. Four hundred fifty patients with open tibia fractures were randomly assigned to receive SOC (intramedullary nail and soft tissue management) or SOC + rhBMP-2 (0.75 mg/mL) or SOC + rhBMP-2 (1.5 mg/mL). rhBMP-2 (1.5 mg/mL) use reduced the frequency and invasiveness of secondary interventions, reduced infection rate (grades IIIA and IIIB), and accelerated fracture and wound healing. ICBG, iliac crest bone graft; rhBMP-2, human recombinant bone morphogenetic protein-2; SMFA, short musculoskeletal function assessment. One hundred twenty patients with long bone nonunion were randomly assigned to receive rhBMP-7 (n = 60) or platelet-rich plasma (n = 60). Thirty patients with distal radius malunion undergoing corrective osteotomy (stabilized with external fixator or pi plate) were randomly assigned to receive rhBMP-7 (n = 14) or autologous ICBG (n = 16). Time to healing was faster in patients who received autologous ICBG when compared with rhBMP-7 (in conjunction with a pi plate). Twenty distal tibia fractures treated with external fixator and rhBMP-7 were compared with 20 matched controls that were treated with external fixator alone. Seventeen patients with proximal pole scaphoid fractures were randomly assigned to receive autologous ICBG (n = 6), autologous ICBG+rhBMP-7 (n = 6), or allograft+rhBMP-7 (n = 5). One hundred twenty-four open tibial shaft fractures treated with irrigation and debridement and intramedullary nailing were randomly assigned to receive OP-1 (n = 62) or no treatment (n = 62) at the time of final wound closure. One hundred twenty-four tibial nonunions treated with intramedullary rod insertion were randomly assigned to receive either rhBMP-7 or autograft. Twenty-four patients with fibular osteotomy were prospectively randomly assigned to receive rhBMP-7 + collagen matrix (n = 6), collagen carrier (n = 6), demineralized bone (n = 6), or no treatment (n = 6). ICBG, iliac crest bone graft; rhBMP-7, human recombinant bone morphogenetic protein-7. The efficacy of rhBMP-2 in combination with allograft was evaluated for the treatment of diaphyseal fractures with bone defects in a prospective randomized controlled trial (BESTT-ALL) . Adult patients with a diaphyseal tibia fracture and a residual bone defect were randomly assigned to receive either an autogenous bone graft (n = 15) or a combination of an allograft and rhBMP-2 on a collagen sponge (n = 15). There were no significant differences with respect to healing rates between the autograft group (10 out of 15) and the rhBMP-2 (13 out of 15) group. Twelve milligrams of rhBMP-2, on average, was used in each defect. One third of the patients (5 out of 15) in the rhBMP-2 group developed persistent superficial erythema that resolved completely before 12 weeks, and one patient developed transient antibodies to type I bovine collagen. In a recent clinical trial, a high rate of infection was noted in patients with open tibia fractures treated with rhBMP-2 . Two hundred seventy-seven patients with open tibia fractures were randomly assigned to receive either standard of care (reamed intramedullary nail and soft tissue management) or standard of care and rhBMP-2/ACS (rhBMP-2 1.5 mg/mL). The primary endpoint was the proportion of subjects who demonstrate complete healing (clinical and radiographic) at 13 and 20 weeks after definitive wound closure. This study was halted prior to its completion because of a trend toward increased infection rates in the rhBMP-2 group (19%) compared with the controls (11%). The reason for the increased infection rate in the rhBMP-2 group in this study remains unclear. Clinical trials with rhBMP-7 have also shown promise with respect to acute fractures and nonunions (Table 3). In the first prospective randomized trial, tibial nonunions that required internal fixation and supplemental bone grafting were randomly assigned to receive either rhBMP-7 (n = 63) or fresh autograft bone (n = 61) . The primary end-point of this study was rate of fracture union as determined by the clinical criteria at 9 months after surgery. rhBMP-7 (81% healing rate) demonstrated clinical equivalence with respect to fracture union compared with the autograft group (85% healing rate) at 9 months (P = 0.0524) and 2 years (P = 0.93). Interestingly, the proportion of patients who were smokers and had atrophic nonunion was higher (P = 0.57 and P = 0.48, respectively) in the rhBMP-7 treatment group compared with the autograft group. The safety and osteogenic efficacy of rhBMP-7 were subsequently demonstrated in other prospective studies that evaluated healing of critical-sized fibular defects, scaphoid nonunions, and long bone nonunions with this recombinant protein (Table 3). However, in a prospective study, Ekrol and colleagues  reported conflicting results with the use of rhBMP-7 in operative management of distal radius malunions. Thirty patients with a distal radius malunion were stabilized with an external fixator or a pi plate and were randomly assigned to receive either rhBMP-7 (n = 14) or autogenous bone graft (n = 16). The autogenous bone graft group had higher healing rates and shorter time to union (P = 0.02). However, the study sample size was small and there was no power analysis presented in the study for sample size calculation. The rhBMP-7 treatment group had higher rates of inflammatory swelling and osteolysis at the site of malunion site. rhBMPs are among the most common biologic agents used for enhancing bone repair. However, there are certain hurdles limiting their efficacious use in humans. First, rhBMPs have a short half-life and a single dose may not be enough for healing of large bone defects that are seen with revision arthroplasty and high-energy trauma [4, 41]. Second, despite recent advances in the delivery systems for BMPs, the ideal carrier matrix for rhBMPs has not been identified. Currently, an ACS is commonly used as a delivery vehicle for rhBMPs, but kinetic studies demonstrate that half of the drug is eluted in the first hour and two thirds of the drug is released in the first four days . Third, supraphysiologic doses (in milligrams) of rhBMPs are currently being used in humans, and the long-term effects of this dose on non-musculo-skeletal tissue or growing skeleton are not clearly known. Consequently, rhBMPs are not FDA-approved in the pediatric age group, in pregnant patients, or in the presence of tumors. Finally, there are complications associated with rhBMPs that either are related to the initial inflammatory response induced by the proteins (neck swelling, seroma, neuritis) or are an extension of their osteoinductive function (heterotopic ossification, paraplegia, transient osteopenia) . The complications in cervical spine can be life-threatening (severe respiratory compromise) and cause serious morbidity (heterotopic formation, severe dysphagia, and increased risk of infection). rhBMP-2 is not FDA-approved for use in the cervical spine, and the FDA issued a health-care alert regarding rhBMP-2 use in the cervical spine in 2008 [43–45]. Currently, with respect to fractures and nonunions, rhBMP-2 is FDA-approved for the treatment of acute open tibial shaft fractures stabilized with an intra-medullary nail and treated within 14 days of the initial injury. rhBMP-7 has received humanitarian device exemption approval as an alternative to the autograft in recalcitrant long bone nonunions in which the use of autograft is not feasible and the alternative treatments have failed. Recombinant BMPs are very expensive, but proponents of this therapy believe that it may be more cost-effective given that it may minimize secondary procedures. According to a recent Cochrane review, there was limited evidence to suggest that BMP may be more effective than controls for acute tibial fracture healing . However, rhBMP use in acute open tibial fractures might be more favorable economically when used in patients with the most severe open fractures (grade III open fractures) . Therefore, although BMPs are the most potent osteoinductive agents available today, their cost and high doses needed to induce an appropriate biologic response in humans limit their utility. The fibroblast growth factor (FGF) family consists of polypeptide growth factors (FGF1-10 and FGF16-23) that are implicated in regulation of cell proliferation, differentiation, and apoptosis. FGFs mediate their cellular responses by binding to their receptors (FGFRs 1-4), and this results in activation of intracellular signaling pathways that regulate gene expression . Cell biology and genetic studies in humans and mice have shown that the FGFs are important regulators of osteoblast and chondroblast differentiation. In the osteoblasts, FGF-FGFR signaling promotes expression of multiple genes that are involved in all stages of osteogenesis. FGF signaling also controls osteoblast gene expression and apoptosis . Preclinical studies in both small and large animal fracture models (rat, dog, and monkey) have shown that FGF-2 enhances bone repair and induces early healing . Two prospective clinical trials have examined the safety and efficacy of rhFGF-2 in fracture and osteotomy healing [50, 51]. Both studies suggest a beneficial effect of rhFGF-2 on bone repair. However, none of the clinical studies has demonstrated any significant improvement in the healing rates or reduction in the number of secondary interventions compared with the controls. Clearly, additional clinical studies are required to show equivalence or a significant advantage of this therapy over the current gold standard, autologous bone graft. Members of the platelet-derived growth factor (PDGF) family are dimers of disulphide-linked polypeptide chain (PDGF A-D) and play a significant role in embryonic development and organogenesis, including the axial and craniofacial skeleton . PDGFs exist mainly as homodimers (PDGF-AA, -BB, -CC, and -DD), and their cellular responses are mediated via two tyrosine kinase receptors (PDGFR-α and PDGFR-β) . In adult life, platelets are a rich source of PDGF, especially the PDGF-BB isoform. PDGFs are mitogenic and chemotactic for cells of mesenchymal origin and can induce their differentiation into multiple cell types, including fibroblasts and osteoblasts. PDGFs also upregulate the angiogenic response at the site of tissue repair by increasing the expression of vascular endothelial growth factor . Preclinical fracture studies suggest that rhPDFG-BB enhances bone repair and improves biomechanical characteristics of the callus in a compromised biological environment (diabetic or osteoporosis) . The safety and efficacy of rhPDGF have been evaluated in prospective randomized clinical trials in foot and ankle arthrodesis [55, 56]. In a prospective controlled pilot trial under the FDA-approved Investigational Device Exemption, 20 adult patients who required ankle or hindfoot fusion were randomly assigned to receive rhPDGF (n = 14) or autogenous bone graft (n = 6). The primary end-point was time to osseous union. There were no significant differences with respect to radiographic osseous union between the rhPDGF group (85%) and the autogenous graft group (100%) at 3 years. However, the study was underpowered. RhPDGF-BB in combination with beta tricalcium phosphate is currently approved by the FDA for the treatment of periodontal bone defects. Further clinical studies are necessary to evaluate the role of PDGF in the management of acute fractures and nonunions. Parathyroid hormone (PTH) is a polypeptide protein hormone (84 amino acids) that plays an important role in calcium homeostasis and bone remodeling. The biologic functions of PTH are mediated by binding to and activation of G protein-coupled PTH receptor, which in turn activates the protein kinase A and protein kinase C signaling pathways . In addition, PTH activates the β-arrestin-mediated extracellular-regulated kinase signaling pathway. The principal physiologic function of endogenous PTH is to increase the blood calcium levels by increasing the osteoclast-mediated bone resorption (catabolic effect). However, intermittent administration of exogenous PTH leads to increased bone formation and improves the microarchitectural strength of the bone. The molecular and cellular mechanisms underlying this anabolic effect are not clearly understood. However, in vitro studies and in vivo data in mice have demonstrated that intermittent PTH administration promotes pro-survival and pro-differentiating signaling in the osteoblasts and leads to an increase in osteoblast numbers and therefore more bone formation . Teriparatide is a synthetic/recombinant human PTH consisting of a 1-34 N-terminal amino acid sequence of the intact PTH molecule [58, 59]. In preclinical animal models (fracture, osteotomy, and distraction osteogenesis), intermittent administration of teriparatide, such as with once-daily injection (dose range of 5 to 200 μg/kg), has been shown to enhance early chondrogenesis and endochondral ossification, which results in increased callus formation (callus volume and bone mineral content) and superior biomechanical strength of the callus . Clinical trials have reported mixed results with recombinant PTH peptides in fracture healing [61–63]. In a prospective randomized multicenter clinical trial, postmenopausal women with distal radius fractures that were treated with closed reduction were randomly assigned to receive once-daily injections of placebo (n = 34) or 20 μg of teriparatide (n = 34) or 40 μg of teriparatide (n = 34) for 8 weeks . There was no significant difference between the placebo and 40 μg teriparatide group with respect to time to restoration of cortical continuity, which was the primary end-point of this study. However, post hoc analysis found that the lower dose (20 μg) of PTH in the study significantly reduced (P = 0.006) the time to cortical restoration. The authors of the study subsequently performed a separate post hoc subgroup analysis to identify the differences in the qualitative appearance of callus at earlier time points . There was a trend toward improvement of early callus formation with the teriparatide treatment. Recombinant PTH (1-84) is approved for treatment of osteoporosis in Europe and recently was evaluated for its role in the healing of pelvic fractures in older patients . Sixty-five patients who had osteoporosis (T score of less than −2.5), were more than 70 years old, and sustained a unilateral pelvic fracture were randomly assigned to receive daily injections of 100 μg of PTH 1-84 (every third patient was enrolled; n = 21) or no treatment (control; n = 44). All patients received oral calcium and vitamin D3 during the entire study period. The primary outcome of this study was time to radiographic and clinical fracture healing. At 8 weeks, which was the primary end-point of the study, all of the fractures in the PTH group and four fractures in the control group had healed (P <0.001). There was a significant reduction in the median time to complete radiographic healing in the PTH group (7.8 weeks; P <0.001) compared with the placebo (12.6 weeks). Furthermore, the functional outcome scores were significantly better (P <0.001) in the PTH group. This study demonstrates that PTH 1-84 accelerates pelvic fracture healing and improves functional outcome in older female patients with osteoporosis. A weakness of this study was that the patients were recruited chronologically and the sample sizes were unbalanced (every third patient was allocated to the PTH treatment group). Interestingly, all of the patients in the experimental group were recruited from one center. Despite these study design limitations, the study represents a major step toward identifying the indications and feasibility of systemic anabolic therapy for enhancing fracture healing. PTH is generally considered safe in humans and has been well tolerated without significant adverse effects in clinical trials. However, rat toxicity studies have demonstrated a dose- and duration-dependent appearance of osteosarcomas with high doses of teriparatide . Even though the doses of teriparatide used in the animal studies were far higher and their durations were longer compared with the doses used in humans, teriparatide is contraindicated in patients with primary bone tumors, including osteosarcoma, and in patients with metastatic bone tumors. Other contraindications include renal failure, Paget's disease of bone, metabolic bone disease other than osteoporosis, any condition that leads to hypercalcemia, and pediatric patients . Teriparatide is not FDA-approved in the US for use in acute fractures or nonunions, and its current approval is restricted to postmenopausal women and men with osteoporosis who are at high risk for sustaining fragility fractures. However, a number of case studies in the literature demonstrate the successful use of PTH to treat fractures [62, 64–66]. An ideal bone graft should be osteoinductive, osteoconductive, osteogenic, and angiogenic. Furthermore, it should provide mechanical support and promote physiologic healing without any significant adverse effects. Regenerative strategies like the use of recombinant growth factors or osteogenic cells or osteoconductive scaffolds alone or in combination may be effective for delayed unions or simple nonunions . However, large bone defects with compromised biology may not be amenable to simple regenerative strategies and will require polytherapy, which incorporates all of the critical components that are required for bone healing. Ex vivo regional gene therapy using genetically manipulated mesenchymal stem cells is one of the ideal strategies for managing difficult bone repair scenarios [3, 4]. The major advantage of ex vivo gene therapy is that the genetically manipulated stem cells not only secrete osteoinductive growth factors that recruit host osteoprogenitor cells via paracrine signaling (osteoinduction) but also differentiate into osteoblasts via an autocrine mechanism and participate in new bone formation (osteogenic) [3, 67, 68]. Consequently, more robust new bone formation is seen in the critical-sized bone defect model with ex vivo gene therapy than seen with the use of rhBMP-2 . Unfortunately, gene therapy has safety issues that need to be addressed before it can be made clinically available for treatment of nonunions. Another major limitation of ex vivo gene therapy is the need for culture expansion of stem cells prior to implantation, which is time-consuming and not cost-effective. We have developed a novel 'same day' ex vivo gene therapy strategy in our laboratory, where fresh bone marrow cells are genetically manipulated with a lentiviral vector expressing BMP-2, seeded onto an osteoconductive scaffold, and implanted into the host bone defect in a single sitting without the need to expand these cells in culture  (Figure 2). 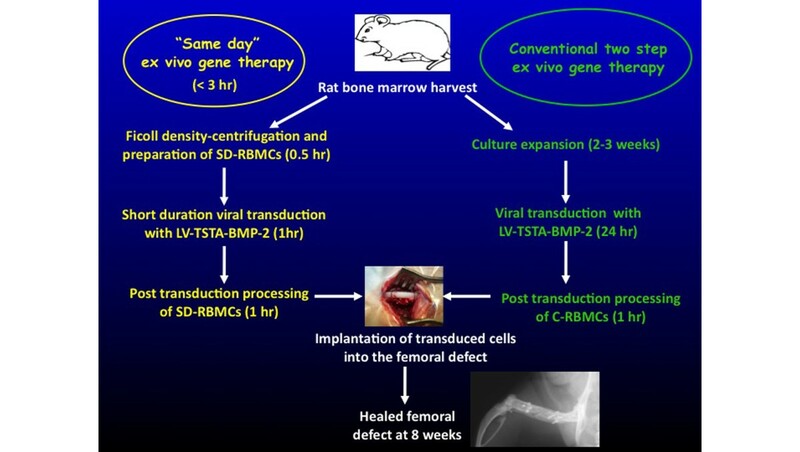 Results from a preclinical study in a rat critical-sized femoral defect model demonstrated that the quality of new bone formed with the 'same day' strategy was superior to that formed with the conventional ex vivo gene therapy. The 'same day' strategy represents a significant advance in the field of ex vivo regional gene therapy because it offers a solution to the limitations associated with the culture expansion process required in the traditional ex vivo approach. This strategy could be cost-effective when adapted for human use. 'Same day' ex vivo gene therapy. BMP-2, bone morphogenetic protein-2; C, cultured; LV, lentiviral vector; RBMC, rat bone marrow cell; SD, same day; TSTA, two-step transcriptional amplification. There is also interest in the in vivo approach, in which the gene of interest is injected directly into the bone defect site [70, 71]. The advantage of this strategy is that it is simple. The disadvantage is that there must be sufficient cells to respond to these signals. There has been increasing interest in using off-the-shelf biologic products for healing critical-sized defects . Freeze-dried cortical allografts coated with cell-free viral vectors (AAV) expressing BMPs have shown significant promise in the healing of critical-sized bone defects in preclinical studies. The healing rates are comparable to those of autograft, but there is reduced graft resorption and improved torsional biomechanical strength in healed defects. However, safety issues related to viral vectors are critical impediments to its clinical use . There is a great deal of interest in the development of biologic agents that can be administered systemically to enhance bone repair . The major advantage of this strategy is that healing can be stimulated for a prolonged period of time and it is not invasive. Recombinant PTH is available clinically, but two more agents, sclerostin antibody and anti-Dkk-1 (anti-Dickopff antibody), are currently being developed for enhancing bone repair in humans. Sclerostin is a member of the DAN family of glycoprotein that acts as a negative regulator of osteoblast development and bone formation . Although the specific molecular mechanism by which sclerostin inhibits bone formation is an area of continuing investigation, basic science and translational studies have demonstrated that sclerostin can bind to BMPs and Wnt co-receptors (LRP 5 and 6) and inhibit BMP-mediated bone formation as well as the canonical Wnt signaling pathway . In preclinical fracture studies, systemic administration of neutralizing antibodies to sclerostin significantly increases the bone mass and callus and biomechanical strength of the callus . Using a rat closed femur fracture model and a primate fibular osteotomy model, Ominsky and colleagues  demon-strated that the systemic administration of sclerostin antibody significantly increased the callus bone mass and bone volume fraction at the site of fracture/osteotomy and improved the biomechanical strength of the callus. Unpublished data from our laboratory demonstrate that sclerostin antibody enhances bone repair in a rat criticalsized femoral defect model. Femoral defects that were treated with sclerostin antibody demonstrated increased new bone formation at the defect site, and a few of these defects actually healed completely . Sclerostin antibody does not appear to be an osteoinductive agent but clearly can promote bone repair when used in an appropriate clinical scenario. Sclerostin antibody is currently being assessed in clinical trials. Dickkopf-1 (Dkk-1) is a secreted glycoprotein and is a potent antagonist of the Wnt/β-catenin pathway, which is one of the important regulators of bone mass . Systemic administration of anti-Dkk-1 antibody in preclinical animal models has demonstrated enhanced endochondral bone formation and improved fixation strength of the implants in bone by increasing trabecular bone formation around the implant . The potential advantage of these systemic agents is that they can be used as an adjuvant to promote fracture healing. For example, it is often difficult to determine when to intervene in a tibia fracture that is healing slowly. These agents have the potential to promote healing without surgical intervention. These agents could also be used to enhance bone repair after bone grafting procedures. This hypothesis will have to be proven in clinical trials. However, if effective in this scenario, this strategy would represent a paradigm shift in the management of difficult fractures. The administration of a systemic agent could continue to promote bone repair for months after the index surgical procedure. Not all of the biologic therapies are the same with respect to their osteoinductive, osteogenic, or osteoconductive potential. The size of the bone defect, the extent of soft tissue injury, and the biological potential of the host all influence the type of treatment that is necessary to promote bone repair. The osteoinductive effect of BMP-2 and -7 is well documented and supported by level 1 evidence in clinical trials. However, other biologic agents either are lacking level 1 evidence or did not show efficacy in level 1 studies. It is essential that the clinical studies evaluating these biologic agents include the following: well-defined inclusion and exclusion criteria, the use of objective measures to assess bone healing, and validated patient-reported outcome measures to determine efficacy [80–82]. Reynolds and colleagues  developed a union ratio, which computes the union between host callus and graft, as a novel biometric for non-invasive assessment of functional strength and failure risk of allogeneic bone graft. This tool may be of value to investigators trying to determine defect healing. Finally, cost-effectiveness must also be demonstrated for all of these treatment regimens . Successful fracture healing requires mechanical stability and a viable biologic microenvironment. Fractures with a compromised biology will benefit from treatment options that can augment the biologic potential at the site of bone repair. Recombinant growth factors (rhBMPs), cell-based therapies (BMAs and stem cells), and anabolic agents (rhPTH) all have clinical potential. Both preclinical and early clinical data with the use of these agents are promising and suggest a potential pivotal role in the treatment of acute fractures, delayed unions, and non-unions. Studies are required to optimize these therapies, define their specific indications for use, and address safety issues. human recombinant bone morphogenetic protein. JRL has received research support from Amgen, Inc. MSV has no competing interests.